I hope the picture below didn't scare you! I've been wanting to try out a face mask for a while, so when Skin Free gave me the opportunity to try some products, I chose the Green Clay Mask for Blemish Prone Skin (seen below); the Spa Scrub Power Pak; and the Niaouli Butter Stick™. I liked the mask. (One warning: be sure to close your mouth before it starts to dry! My mouth got really dry because I couldn't close it until I washed it off!) The mask has some very strong scents that were a bit overpowering at first, but I quickly adjusted. The mask washed off easily and my face did feel softer. I asked for the Spa Scrub Power Pak because my heels are so rough. I did notice a difference after using the sugar scrub. I would have really enjoyed it if I had someone use the scrub on me (ala manicure!). I didn't like the Niaouli Butter Stick as much. It was recommended for my cracked heels. On my heels, it felt kind of odd, and I stuck to the floor. I it might worked better if I had put socks on. The stick smelled good. It looks like a giant tube of chap stick (and kind of felt like it too). * Visit Skin Free and tell me what you buy with your $30 gift certificate. Contest ends Monday August 10th. Hi there, just stopped by from blogher@home. I love your layout! this looks great- courage for the picture huh? i love it! thanks for the giveaway!! Thank you for a great review and giveaway. I would like to get the Skin Free Firming Matrix Creme for Face. I found you thru Online- Sweepstakes. i really want to win this giveaway. and you look as good in green as i do. I would get the Eczema Relief Kit. I'd like to try the Whipped Tamanu Body Butter™. Thank you! you birthday button is on my blog under specials. Thanks for this fabulous giveaway! I would so very much LOVE to win. I was recently laid off and could really use a pick-me-up...and this Skin Free gift certificate would do just the trick! I would also really like to try the Super Moisture Butter Creme. I have really dry skin, so I could use this! please do check out my blog and enter my giveaway! I've been eager to try these products thanks for the giveaway & insight about the face mask! I'd love to try this line. I've heard they have great stuff for blemish prone skin. Skin free looks like a great line, the mask sounds so good for my skin. I'd love you to check out my blog! 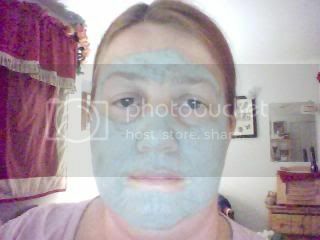 I would get the Green Clay Mask and Lite Moisture for Blemish Prone Skin. I am a regular reader, and that's how I found you! My friend emailed me about this giveaway. I'd buy the Green Clay Mask for blemish prone skin. I'd love to win this to get the Excema relief kit, I've got it bad! Thy have some neat things. I love trying new bath and body products. I would get the Spa Scrub Pak. Great review! I'd love to try these. I found you through Sweepstakes Advantage. From the website I would get the Green Clay Mask for Blemish Prone Skin, and also the Niaouli Scrub for Blemish Prone Skin. This would be fabulous to win! The products aren't sold in my area and that Whipped Tamanu Butter is calling my name, LOL! With the GC I would get some of the whipped tamanu butter and eczema relief kit, great stuff! I have that exact mask. The first time I tried it my son looked at me funny and asked what did you do to your face? My comment is thank you for sponsoring this giveaway. I found your giveaway through the Contest Corner link on my blog. Too cute! :) I've been wanting to try the Spa Scrub Power Pak, thanks for the chance! I like the Spa Scrub Pak. Great Review, thanks for the chance to win. I like the Eczema Relief Kit. Please accept my entry. Thank you. What a great line of products. I would like to try the Corrective Face Nectar. I would like to try the lite moisturizer and clay mask for blemish prone skin. Skin Free sounds very beneficial to me and I would like to try several of their products, such as the Corrective Face Nectar. I want to try their products! I would use the giftcard on the Spa Scrub Power Pak! I would pick the spa pack. I would love to try their products especially the Skin Renewal System. Ive heard great things about SkinFree products, I'd love to try them! Wow, these products look awesome! Thanks for the opportunity to win! I would definitely buy the Niaouli Butter Stick, I've wanted to use it on my feet for quite some time! Thanks for the giveaway! Thanks for the pic w/ the mask! I would love to try some of the products for my husband since they say they're good for psoriasis. I found you at online sweepstakes. If I won I would buy some of the Niaouli Scrub and some of the bars. i have been wanting to try that face mask, thanks for the tip! I would get the Whipped Tamanu Body Butter™ and the Sweet & Smooth Sugar Scrub™! I would love to win some of these products. Thanks. I found you on a sweepstakes site. I would like the Nutritional and Anti-Oxidant Synergy for Face. I found you through a giveaway listing. I love the Extra Moisturizing liquid soap!